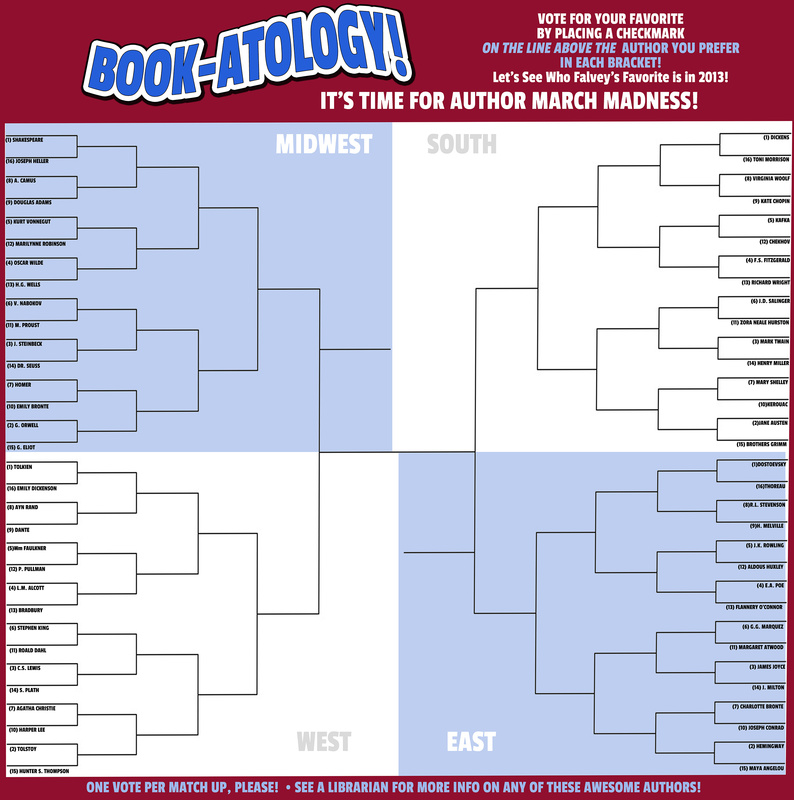 Falvey Memorial Library :: Literary Titans Clash in Library's March Madness! Literary Titans Clash in Library's March Madness! Author March Madness is underway in Falvey Memorial Library! Students and staff have placed first-round votes for their favorite authors in our bracketed tournament, posted on the first floor of the Library. The tournament is now entering its second round, so make sure to check out the poster and vote for your favorite author. Joseph Heller, hoping to razzle-dazzle with his moves in the low post(modern), was absolutely trounced by William Shakespeare, a number one seed and heavy favorite in the tournament. Heller lost 12-3. All best to Billy Shakes anon—I see him making it to the Final Four, no sweat. The matchup between John Steinbeck and Dr. Seuss proved particularly contentious, with Dr. Seuss advancing with an 8-6 victory. Did you know that Dr. Seuss actually penned his own version of The Grapes of Wrath? Just kidding, that’s a lie. Orwell squared off against Eliot in a battle of the Georges. Orwell took the match 10-4, and during Women’s History Month! We should all be ashamed of ourselves. Ayn Rand proved weak against Dante when she couldn’t go left. The classic poet won the match-up 11-1, the most lopsided victory in the tournament thus far. Kentucky-boy Hunter S. Thompson pulled a major upset over Yasnaya Polyana-boy Leo Tolstoy, defeating the Russian heavy hitter by a single vote. When reached for commentary, Thompson slurred something about vultures. It was beautiful. All eyes were on the Dickens/Morrison game. Morrison somehow entered the tournament with a 16 seed, creating this overpowered first round match-up. It was close, but Dickens squeaked by, 7 votes to Morrison’s 6. The Brothers Grimm had their Cinderella story cut short by Jane Austen, who advances to face Mary Shelley in round two. I’m rooting for Shelley in this one, but my prediction is that Austen will take it by a landslide. The East is absolutely stacked this year, making for some fine first round match-ups between some major American icons. Fitzgerald beat Richard Wright 12-2 and omigod speaking of icons you guys, can you believe Leo is playing Gatsby in the upcoming film?!? So American-dreamy. Aldous Huxley pulled an unfortunate match-up against J.K. Rowling, a heavy tournament favorite. J.K. Rowling took it 12-8. Huxley would totally be a Hufflepuff, by the way. What a nerd. So there you have it—be sure to stay tuned to the Library News blog for further re-caps and updates. Now get out there and cast your vote for the second round! Glad I voted yesterday. Go W.S!